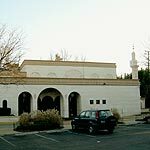 Dar Al Hijrah Islamic Center is located in the Washington, D.C. Metropolitan area. The center includes a school, a library and a gymnasium. The congregation is very diverse, with worshippers coming to the center from many ethnic backgrounds. Dar Al Hijrah conducts seminars, lectures, religious sermons and other activities to serve both the Muslim and surrounding communities.